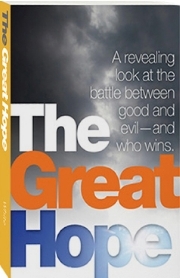 The Great Hope, with various cover designs (also named The Great Controversy), is being distributed around the world as part of a massive outreach of the Seventh-day Adventist Church with the goal to reach 166,600,000 homes during 2012 and 2013. The purpose of this huge expenditure of money is to convince you to join their church, even if you are a member of a Christian denomination. 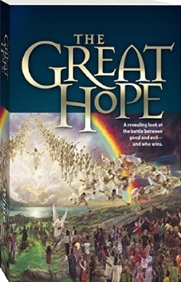 The book is a condensed version of The Great Controversy by Adventism's prophet, Ellen G. White. The book teaches a worldview which is not biblical—one in which Jesus is in a battle with Satan and humans help Jesus win. Another teaching is that in the near future Catholics and Protestants—everyone who doesn't keep Saturday holy—will join forces to kill Adventists. Below are links to study the errors of Adventism and its great controversy worldview. We offer these resources for two reasons: 1. We desire to expose the true source and nature of "The Great Hope" for the benefit of the nearly 167 million homes that will receive it, and, 2. We love our Adventist family and friends and desire that they find the true Gospel and follow Jesus and the Bible alone. 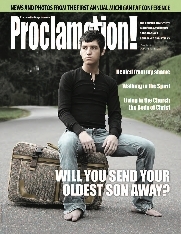 © Copyright 2011-2012 Life Assurance Ministries, Inc., Casa Grande, Arizona, USA. All rights reserved.